Four Weddings and a Kiss is a great way to sample four authors, three of which I had never read before. It is composed of four Novellas, written by Margaret Brownley, Debra Clopton, Mary Connealy, and Robin Lee Hatcher. Overall I enjoyed this book, but I would not count it as a favorite. It is a book I will pass on to friend as a fun, instant gratification kind of read. 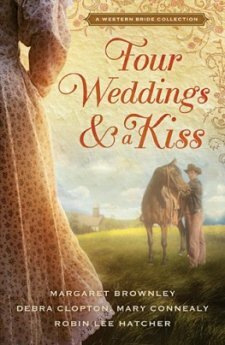 If you enjoy books that are quick to get to the point and offer instant gratification, Four Weddings and a Kiss is a great choice for you. It is ideal for long trips in the car or a vacation type read. I was given a complimentary copy of this book by BookLookBloggers and the publisher in exchange for an honest review. All opinions are my own and I have not been compensated.